Scruff at the end of a stinking hot day at Mahoneys Reserve. The VTAC offers are scheduled to be released today. Any hopes of Kiddo opting for a BA/LLB course in Monash have been reduced to a mere theoretical possibility, as she has been really excited about doing the PhB course in ANU in Canberra instead. 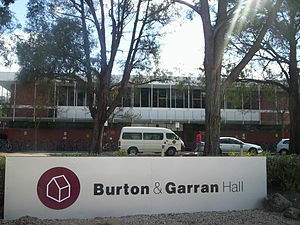 I have in fact, paid a deposit for her residential college in the Burton and Garran Hall (“B&G”). Tress had also set Kiddo up with a supplementary credit card and got it activated and ready to go. We’re likely to be taking that long hike to Canberra again, around the second week of Feb.
On Saturday, we made a vegetable soup together. It’s a continuation of Kiddo’s cooking lessons. The class took place in between two hefty sessions of cleaning. After the usual vacuuming, Tress, Kiddo and I settled down for some soup, after which I went out and continued hacking down our overgrown Silver Stirling hedges. Well not exactly hacking down but bringing them down from a monstrous 3+ meters to a more manageable 2 meters or so. Earlier that morning Tress and I had gotten up early to get to Tullamarine again – this time taking a young lady doctor from Mulgrave who was going back to Malaysia for a short holiday. We got to her home just before 7, dropped her off at Tulla just before 8am and got to the Vic Market to get stuff for a barbeque we did last night. So all in it was a long and busy day and after prepping the communion spiel and other bits I had to do in church the next day, the 3 of us settled down to a game of cards for a bit. On Friday we had gone to the Knox for a movie – a very ordinary Sherlock Homes sequel (“Game of Shadows“). It was a disjointed and messy fare and loads of bomb blasts and slow-mo running, jumping and fist fights… sigh. Last night we had 3 families over for a barbeque dinner. Sort of 3 families – one still has her hubby and kids in Singapore for their holidays, and she had returned to Melbourne early to go back to work. We again finished up late – it was about 12am when we got to bed, and gym this morning was sort of tough. If it sounds like we’re trying to cramp our weekend, I guess I am. 3 weekends from now, our weekends will be very different. I just want to keep the good thing firing on all cylinders while we can.